As a resident of Llandaff (for non Cardiffians, a suburb of Cardiff which as it has its own Cathedral is actually a “city within a city”), I have been waiting for a while for what I regard as a go to restaurant to set up shop. We have a number of restaurants and pubs in Llandaff, which are OK if nothing to “write home about”. In short Llandaff has, ever since I moved there, been crying out for a really decent neighbourhood restaurant. 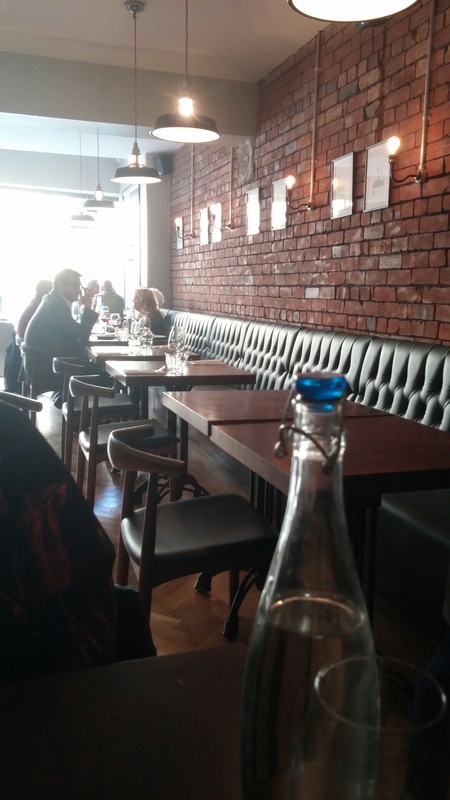 I therefore have watched, with interest and increasing excitement, the slow but sure transformation of a space on Llandaff High Street into Porro, an Italian – ish (their words not mind) restaurant brought to us by the people behind The Potted Pig. I had a number of false starts in trying to get to Porro, being too busy in work to attend their launch night and then breaking my foot on the day I had a table booked. I thought I had managed to overcome my seeming Porro jinx and finally made it to the place, albeit on crutches, only to find I had had a senior moment and by mistake booked (online) for the wrong day (I was out by a week). Seeing the truly pitiful look on my face when I realised my error (and the fact I was on crutches), they thankfully took mercy on us and squeezed Mrs.SF and I in. I have (as stated above) kept a beady eye on Porro, both on Twitter and in the physical world, as it has developed and liked very much what I had seen. It is a lovely space with bare brick walls, parquet flooring, nice banquettes and a “shaker” style blue decor. I rather liked the look of the place, as did Mrs. SF. It is open 7 days a week for breakfast, lunch and dinner, which to me is a real bonus. Breakfast of Italian sausages and eggs on the weekend or a day off really appeals to me, as does the fact it opens on Mondays (a day when few restaurants seems to open) and does Sunday lunches. I was racked with indecison in terms my choice of starter. Polpette or Porro’s namesake (braised leeks on toast with talaggio cheese) or fritto misto or cod cheeks and cockles or some very good looking pasta dishes. Decisions, happy decisions. The pig sticks (£4) were the first order of the day. These can be best described as pork jerky (being chewy rather than crunchy), with a subtle flavour of fennel and chilli on top of their inherent porkiness. 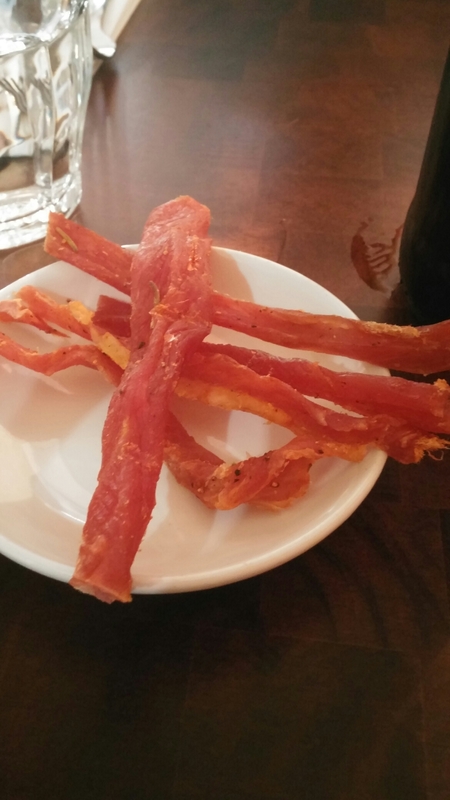 Not quite what I was expecting (thought they would be strips of crackling), but nice enough none the less. For starter, I eventually decided on the polpette (£8). 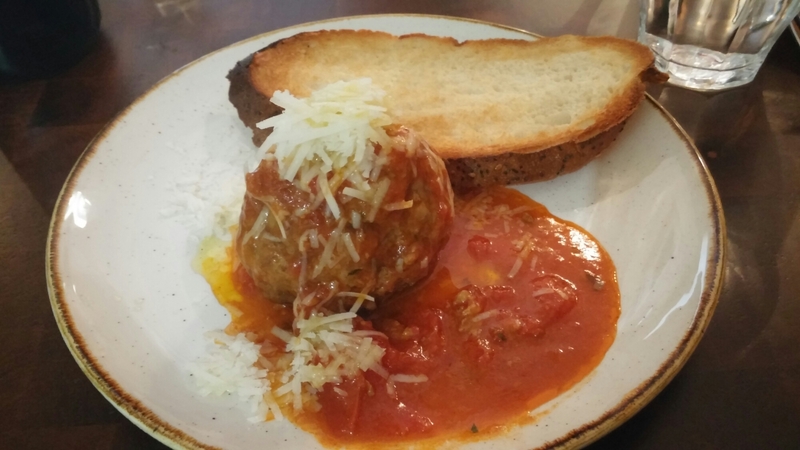 This was a lovely yielding ball of minced Abergavenny beef and Hereford pork, with an intense tomato sauce and topped with a generous amount of grated parmesan cheese. The classic Italian flavours on display here married well with the quality local meat and made for a dish which I really enjoyed it. A slice of decent toasted bread allowed for easy mopping up of the lovely sauce remaining, after I had demolished the meatball. 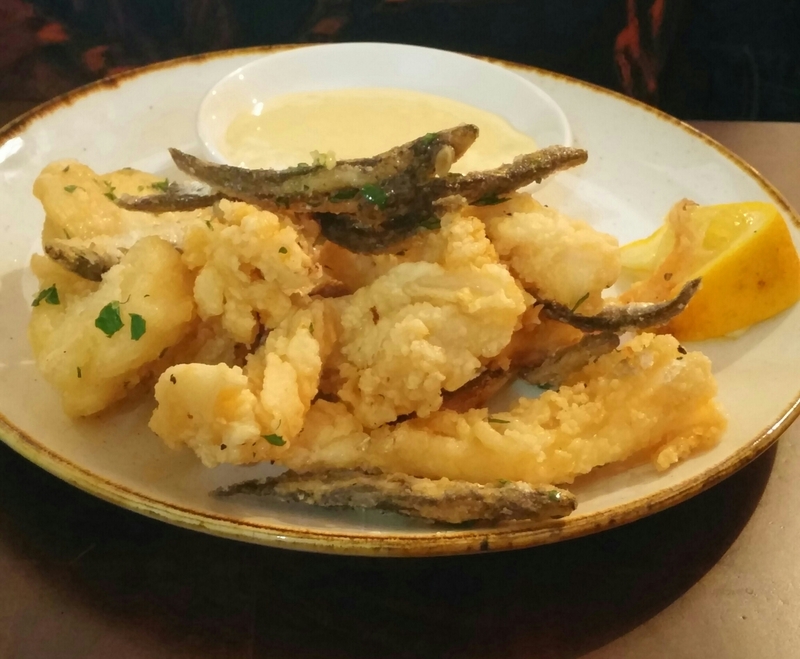 Mrs. SF went for the fritto misto (£7) which was a mix of tender, nicely cooked, squid and white fish in a lovely crisp, light as a feather, batter. Add to this some tiny fried whole fish and a rockingly garlic mayo (not a date night dish this one, unless both of you have it) and I had a happy, if somewhat garlic infused, Mrs. SF. 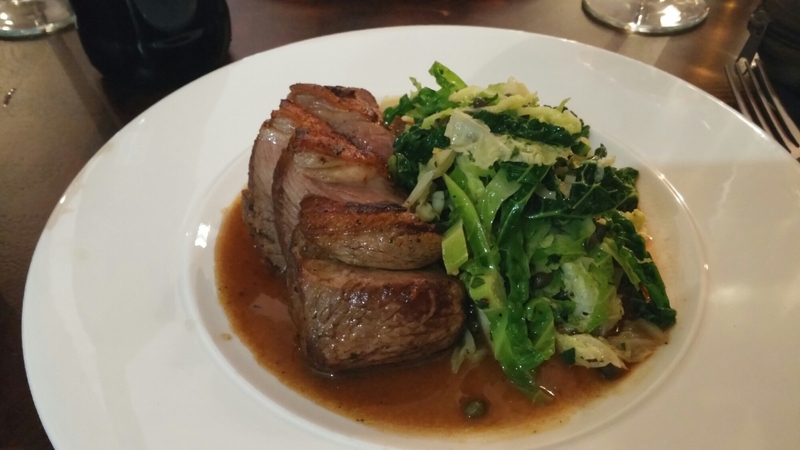 On to the mains, I was verring towards the porchetta but had a last minute change of mind and in the end opted for the Pembrokeshire lamb, with savoy cabbage and capers (£15). 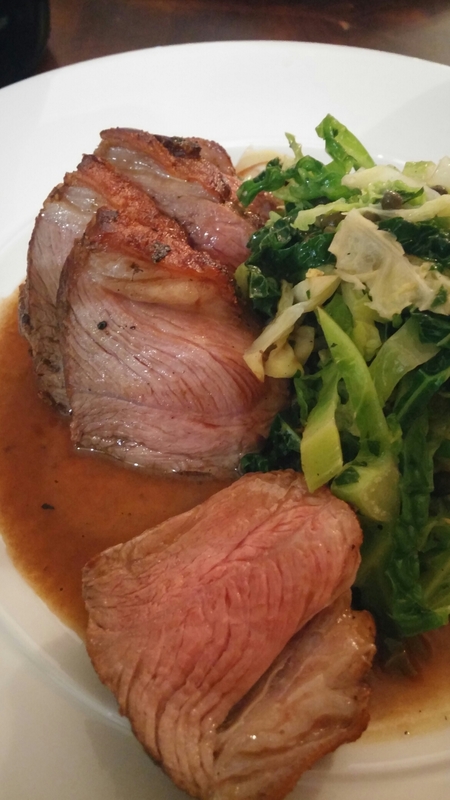 The accompanying savoy cabbage was nicely cooked, retaining a pleasingly crunchy texture, and the capers added a welcome acidity as against the richness of the lamb. It was all topped off by a nicely flavoured lamb jus. As a whole, this dish made me smile. Mrs. SF went for the porchetta, with a carrot, orange and fennel salad. 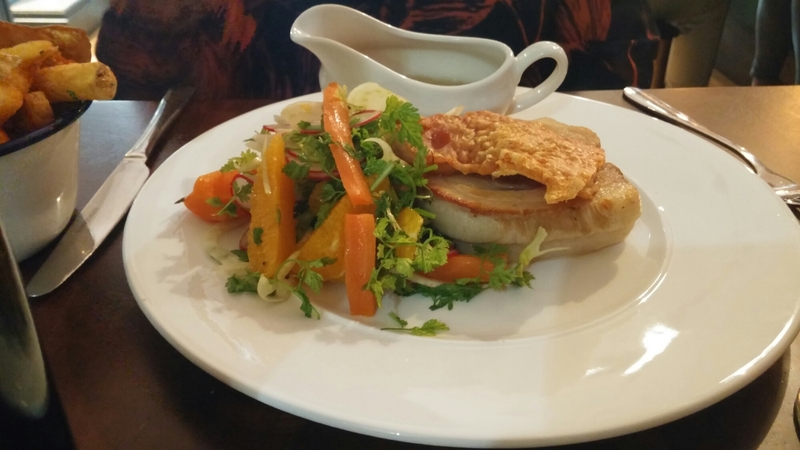 This was again a very generous portion, with two slabs of meltingly tender pork topped with a sheet of lovely crackling (crunchy but not teeth shatteringly so). Mrs. SF thought the richness of the meat was nicely complimented by the aniseed of the fennel (always a good match for pork) and the citrus from the orange. All in all a good dish she though. I had a taste of the Porchetta and would happily order it. The sauce (in a jug) with it did seem somewhat superfluous to requirements (especially with the salad on the plate). We also ordered two portions of their home fries (£4) as sides, there being no starch on either of our dishes. These were very nice indeed, being lovely and crisp on the outside and soft and fluffy on the inside, with a generous application of rosemary. In reality, we didn’t need one of these, let alone two, as portion sizes for the main were large enough. We couldn’t, nice as they were, finish either of the portions we rather greedily ordered withour foregoing pudding (which we were keen to try). Whilst we were quite full after the mains, we thought we could just about manage a shared dessert. 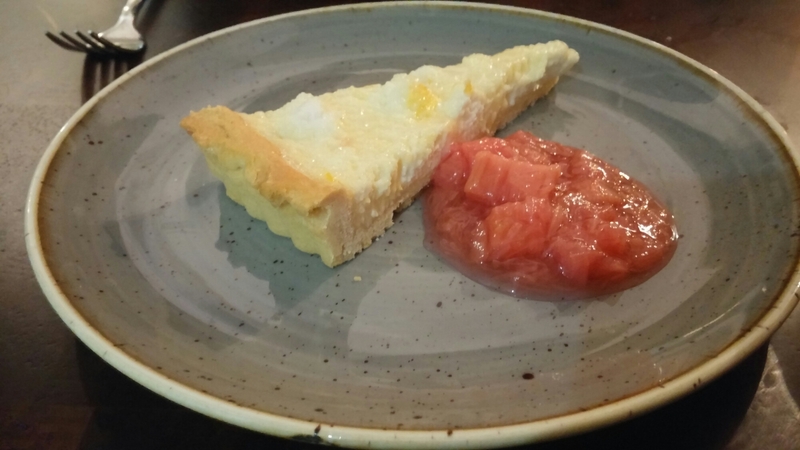 We decided on the lemon and ricotta tart, with rhubarb. This had a good flavour to it, with the pastry nice and crisp and the rhubarb not too sharp. The texture of the very lemony filling was, however, a bit too grainy for either mine or Mrs. SF’s tastes (does somewhat come with the territory with ricotta based desserts mind). Service was good, attentive but unobtrustive, and the meal was nicely paced in terms of timing. No long waits, but enough time to pause for thought between courses. Water was brought to the table without the need to request it, which I like. Special thanks to the “front of house” lady for squeezing us in after my brain malfunction regarding our booking. They have a decent selection of cocktails and beers (including one from Pipes Brewery which is made just a mile or so down the road in Pontcanna) and a small, predominately, Italian wine list which ever so slightly disappointed. This was mainly due to what wasn’t on it rather than what was. Bearing in mind the breadth of choice available in terms of Italian wines and grapes, it was a shame not to see Greco di Tufi, Fiano, Aglianico del Vulture or Nero d’Avola, to name but a few, on the list (as far as I could see). Got to draw the line somewhere I suppose. It was, however, nice to see most wines available by the glass (something more restaurants should be able to do with the technology now available). 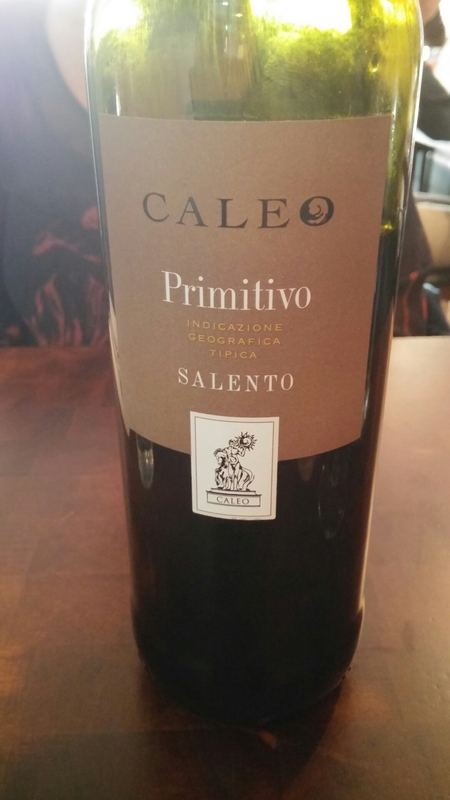 which was (as you would expect from the Primitivo grape) a big hitter and a perfect match for my Polpette (Mrs SF. refrained from drinking this butch red with her starter for obvious reasons), with lots of dark fruit aromas and flavours and a touch of spice and smoke. It also went well with my lamb. The mark up, however, on this wine (which I can get retail for around £7.50) was a bit high, in my opinion, at a whopping 333% (although, in their defence, that sort of mark up is regrettably not that unusual in the UK). 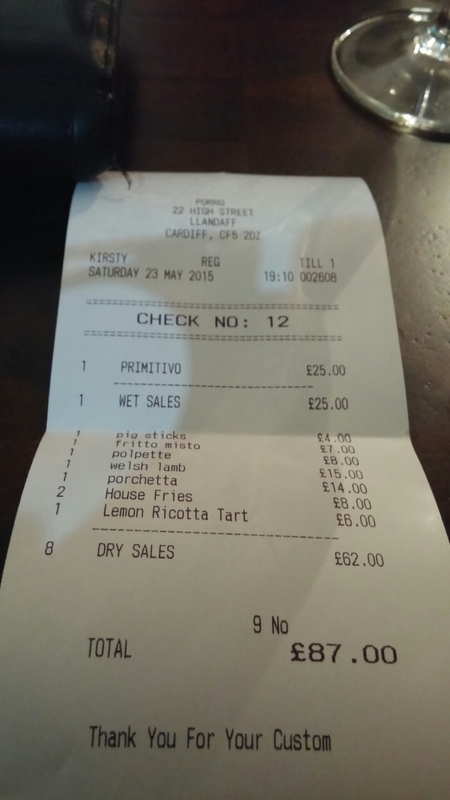 The damage for the two of us with the slightly pricey wine, but without a well deserved tip, was £87. I thought this was reasonable value, as we pigged out a bit. 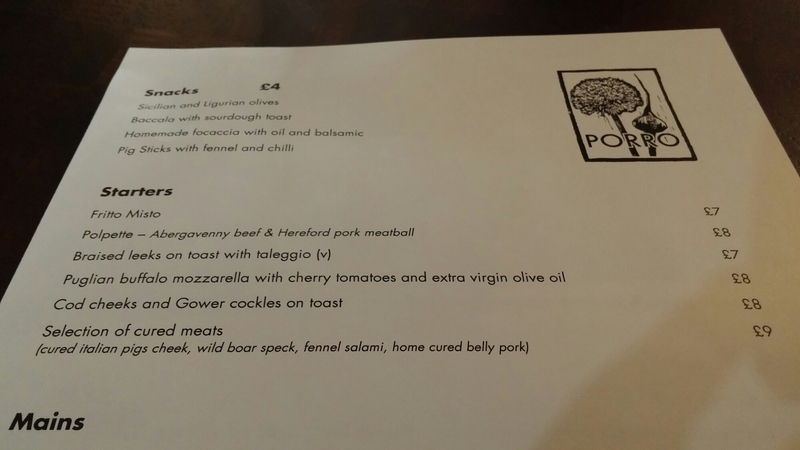 Mrs. SF and I enjoyed our meal at Porro, which is a welcome and much needed addition to the Llandaff dining scene. I often say in posts “I wish I had a good restaurant like this in my neighbourhood”, well now I do. Would I go back? Oh yes, I can see Mrs. SF and I and friends becoming quite the regular visitors to Porro. Lots of stuff on the menu of interest for our next visit, with the pasta dishes and pizzas going to other tables looking rather good (and generously portioned). I will also certainly be paying a visit soon to check out their breakfasts. 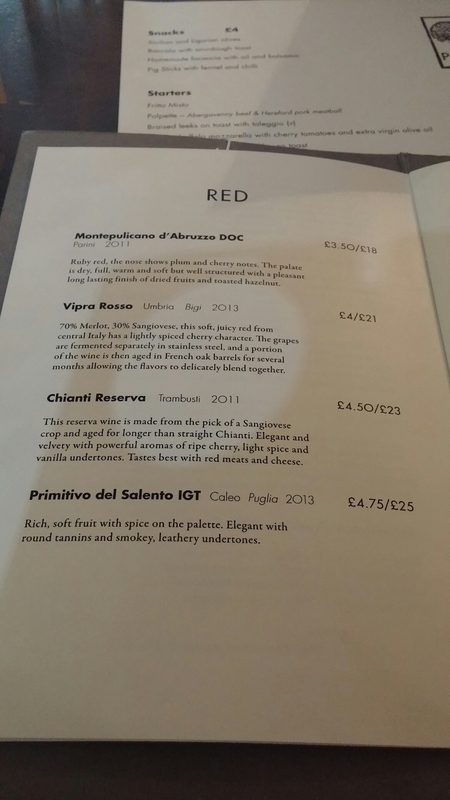 Whilst no complaints as to the quality of the food or the service, I did find the pricing of some dishes a bit perplexing (and I always moan about wine pricing). Perhaps I am missing something, but should linguine and cockles really be more than a large lump of lamb rump with savoy cabbage and capers? Maybe the “Gower” cockles they use are really pricey? Also why was the generously portioned fritto misto, which Mrs.SF had, the same price as the much smaller (based on what was served up to the table next to us) dish of leeks on toast with talaggio cheese ? It can’t be due to the base cost of the ingredients, I would have thought. As I say perplexing. 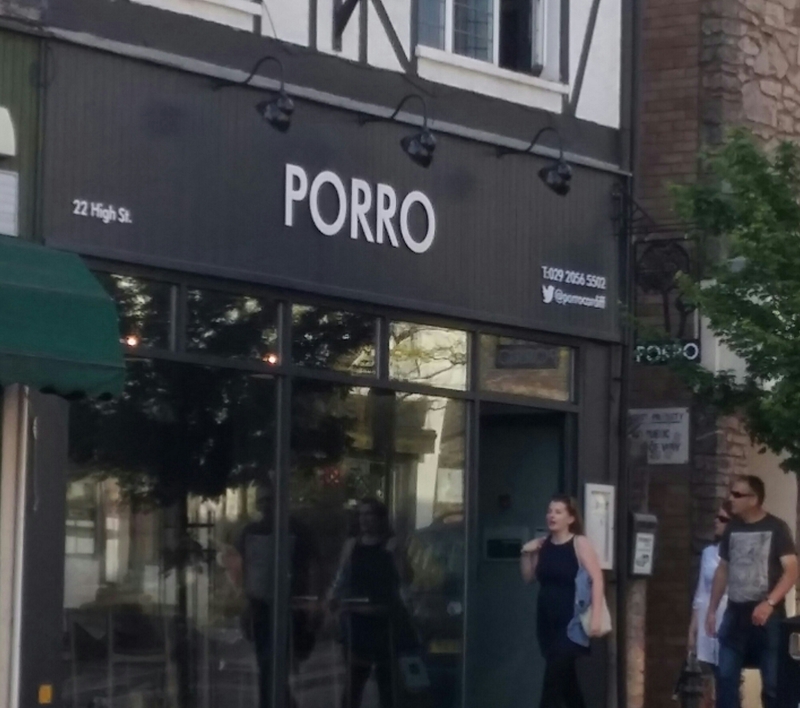 It is, notwithstanding these minor quibbles, as the post title suggests rather “portentoso” (marvellous in Italian) to now have a restaurant like Porro just up the road from my house. Looks like a place definitely worth a visit. 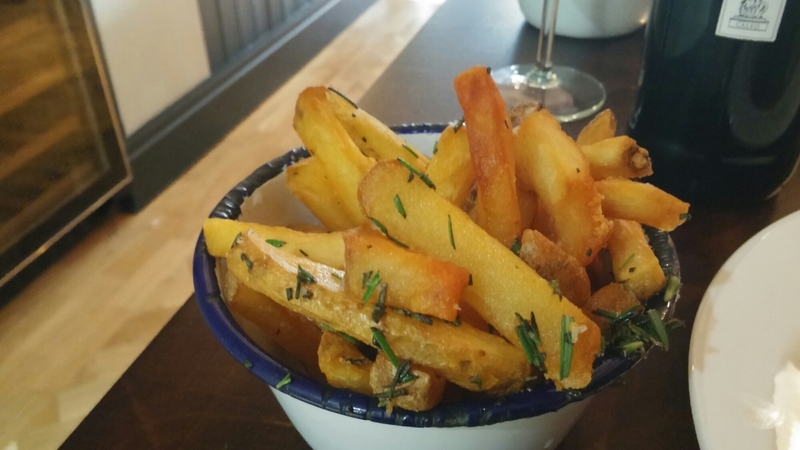 This entry was posted on May 31, 2015 by solicitingflavours in Alcoholic drink, Beer, bistro, Breakfast, Cardiff, craft beer, Drink, Food, Food and wine products, italian, Italian wine, Italy, Llandaff, lunch, New restaurant Cardiff, pasta, pizza, Porro, Red Wine, Wales.